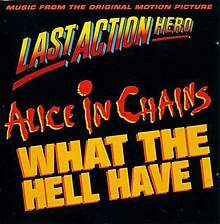 (1993) "What the Hell Have I"
(1993) "Down in a Hole"
"What the Hell Have I" is a song by the American rock band Alice in Chains. It was originally featured on the soundtrack to the 1993 John McTiernan film Last Action Hero starring Arnold Schwarzenegger. The song was released as a single and peaked at No. 19 on the Billboard Mainstream Rock Tracks chart. It was included on the compilation album Nothing Safe: Best of the Box (1999). A remixed version of the song was included on the compilation albums Music Bank (1999) and The Essential Alice in Chains (2006). The song was originally written for their breakthrough album Dirt, but was shelved at the time and used later for the Last Action Hero soundtrack. Contrary to popular belief, Jerry Cantrell did not use a traditional sitar during the recording session although he did attempt to play one but was unsure how. While experimenting with sounds, he adopted a guitar-sitar into the session to achieve the sound of the opening riff. "What the Hell Have I" was released to radio stations on June 7, 1993 in support of Alice in Chains' appearance on the 1993 Lollapalooza tour. The single peaked at No. 19 on the Billboard Mainstream Rock Tracks chart. Allmusic's Jason Birchmeier said that the song is "on a par with those featured on the band's recent (and magnificent) Dirt album." Ned Raggett of Allmusic said that the song "isn't bad at all but on the flipside has little immediate surprise to offer to it." The music video for "What the Hell Have I" was released in 1993 and was directed by Rocky Schenck, who had previously directed the "We Die Young" and "Them Bones" music videos for the band, and who would later direct the music video for "Grind". In the music video, singer Layne Staley's face is projected on him with different expressions, while guitarist Jerry Cantrell is seen with the same contact lenses with a smiley face that was worn by Mr. Benedict (played by Charles Dance) in Last Action Hero. The video is available on the home video release Music Bank: The Videos. ^ a b Russell, Deborah (May 22, 1993). "Sony in Overdrive For 'Hero' Tie-Ins". Billboard. p. 122. Retrieved July 8, 2018. ^ a b Kitts, Jeff (May 1994). "Primecuts: Jerry Cantrell". Guitar School. Archived from the original on July 14, 2014. Retrieved July 8, 2018. ^ a b "Alice in Chains "What The Hell Have I" Chart History – Mainstream Rock"". Billboard. August 28, 1993. Retrieved July 8, 2018. ^ Birchmeier, Jason. "Last Action Hero > Overview". Allmusic. Retrieved 23 July 2009. ^ Raggett, Ned. "What the Hell Have I". Allmusic. Retrieved 2009-02-27.